When the DC and Marvel Universes merged in Marvel vs DC, a new one was created: the Amalgam Universe. This one-shot combined Superman with Captain America. 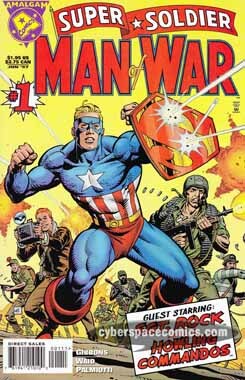 In 1942, Super-Soldier has been given the task of following stolen government equipment that’s being smuggled overseas. But, when the boat he’s on is attacked by Nazi U-Boats, he is distracted with protecting the ship while they make off with the equipment. Meanwhile, Super-Soldier’s pals, Sgt. Rock and his Howling Commandos have been captured by Baron Zemo and his Nazi forces. The very same forces that have stolen the equipment. Fortunately for them, Peggy has infiltrated the Nazi castle, set them free and informed Super-Soldier of their location. The heroes overtake the castle but not before Zemo escapes with the stolen goods. In the last page, Zemo meets with Lex Luthor and reveals that the stolen materials will be used to create a villain that Super-Soldier will not be able to defeat: Ultra-Metallo! This tale of times past in the Amalgam Universe tells the story behind the creation of Ultra-Metallo (the villain from the first Super-Soldier one-shot). It also introduces the Amalgam version of Nick Fury/Sgt. Rock and features the double-villainy of Zemo and Luthor. Unfortunately, it didn’t really capture my interest as I hoped it would and, Gibbons’ art seems very unfinished – especially when it comes to backgrounds (which are missing or very basic, half of the time). No real surprise there since I wasn’t a big fan of the first one-shot, either.